B2B buyers are an elusive bunch, but now you can take a first-hand look at how they are travelling through the buyer's journey. 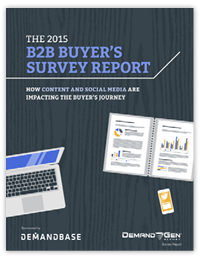 These exclusive findings from Demand Gen Report's 2015 B2B Buyer's Survey will provide you with valuable information on the latest buying trends that will help you better understand your buyers. The critical role peer reviews play in the latter stages of the buyer's journey. Fill out the form to gain the insights you need to bring your prospective buyers closer to conversion.